It was against Everton at home last season that Manchester United threw away their title, conceding two late goals to draw 4-4. Five months later, this time at Goodison Park, they weren’t able to put the ghosts of last season to rest. 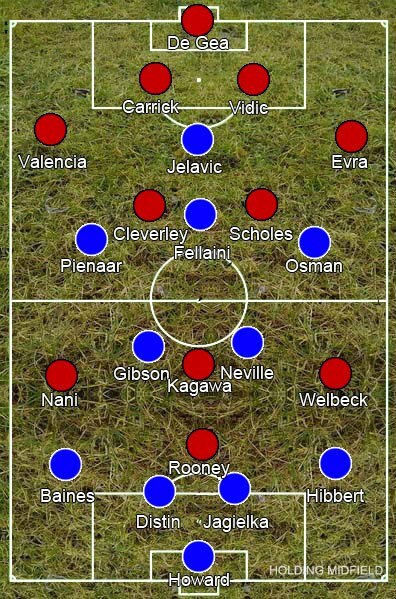 Both teams set out in a 4-2-3-1 shape but had different ideas on how to defend. United looked to press intensely, harrassing Everton high up the pitch, which made sense given, if successful, it would mean less pressure would be put on their makeshift defence. Everton, on the other hand, sat deep and only closed down on a man-to-man basis. After a slow opening, it was Everton who started to control the game. At the start, they had been patiently passing the ball around, but United were trying to make sure the ball couldn’t be played into the feet of the midfielders by blocking off the passing angles. Although Everton weren’t able to play how they wished to, it suited them in the long run as instead of trying work their way into passing positions, they simply hit it over United players to Marouane Fellaini. The big Belgian was heavily praised throughout the game, and rightly so: he was at the centre of everything Everton did. Taking the United front four’s defensive play out of the game, Fellaini did an excellent job as what was essentially a midfield target man – a brilliant idea given the only player who could come close to competing with him in the air was Nemanja Vidic, who would never be able to come that high up the pitch to challenge him. He won pretty much every ball, but was also able to mess with Paul Scholes’ or Tom Cleverley’s positioning by forcing them to meet him in areas that would leave a large gap nearby. Steven Pienaar and Leon Osman were coming inside to join him for most of the game, so every time the ball was dinked over for him, he would lay it off for one of the wingers in acres of space, with little United’s double pivot could do about it. Fellaini also looked to bully the already uncomfortable improvised centre-back Michael Carrick whenever he could, and it wasn’t surprise when he got away from him to head a corner into the net for the only goal. Meanwhile, Nikita Jelavic was pulling off into wider areas, proving difficult to track for the United defence and a wider option for Everton, meaning the midfield was overrun and outnumbered while the defence were left watching out for themselves. United were lacking in attack too. Danny Welbeck made it perfectly clear he wasn’t a winger in his evening on the left and Nani and Wayne Rooney weren’t much better, while Shinji Kagawa had a good albeit uninfluential debut. As usual, they looked good when they moved the ball around at speed, yet when they were forced to probe Everton’s defence, United had nothing to offer. Cleverley looked unsure of whether or not to get forward and support the attack as it meant leaving Scholes with the three attacking midfielders, but about 20 minutes in he did start to venture forward yet remained anonymous, seemingly unsuited to the partnership. After the goal, Everton were happy to simply soak up pressure, dropping deeper into their own half and letting United have the ball in front of them. Robin van Persie made his debut with 25 minutes to go, but had little effect as United completely lacked ideas, making what would normally be an exhausting and near-impossible job a comfortable one. There was one move where Van Persie moved wide and a deeper positioned Rooney looked to play him in, yet that was a single positive from an otherwise uninspired and static spell. Everton’s performance wasn’t particularly special, yet it didn’t need to be. They had tailored themselves to take advantage of United’s weaknesses, did so, then sat back to see what United could reply with. The answer was nothing – good for them but worrying for United, whose deficiencies, while worsened, can’t be explained away by injuries. Fellaini reminded me of manzukic at the euro’s, playing as a deep target man with jelavic ahed of him. I thought everyone were excellently suited to playing united, with the wide players moving inside intelligently and Gibson moving forward as a surprise element at times. Everyone weakness was dieting lack of pace, but united never tried to test that really, with Rooney dropping into the same space as Kagawa. Having either RVP or Welbeck leading the line would have been a better option, while Welbeck look completely unsuited to playing a wide role.